Update: Star Wars Battlefront has a strange, new live-action trailer. Check it out down below. While the original Star Wars Battlefront games had their fans, anticipation for the upcoming reboot has reached fever pitch. 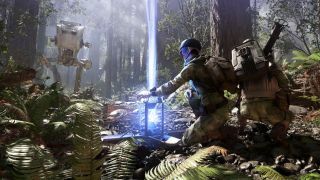 It's a combination of factors; a new Star Wars movie is out later in the year, developer Dice has pedigree in this genre with Battlefield, and the latest generation of consoles are finally able to deliver the sort of visuals we've seen in the movies. Battlefront is set in some of the most iconic locations from the original movies, including Hoth, Endor, and Tatooine, as well as a new location that ties into Episode VII. The game made a big impression when it was playable at E3 this year, winning the Critics' Award for Best Action Game and Best Multiplayer Game. But ahead of the game's launch in November, what do you need to know? Many bothans died to bring us this information. Battlefront will be out on November 17, 2015 in North America, November 19, 2015 in Australia and November 20, 2015 in Europe. It'll be hitting PS4, Xbox One and PC. Bravely, Star Wars Battlefront is doing away with a traditional single-player campaign. If you don't have an active PlayStation Plus or Xbox Live Gold subscription, then all you're really going to be able to do is play through the game's Missions mode either solo or in split-screen co-op. PC players don't get a split-screen mode, strangely, but at least they can play online for free without the need for a subscription. EA Access is a service for Xbox One that allows fans of the company (a repeat winner of the "Worst Company in America" award) to play its games ahead of release. EA has said that Star Wars Battlefront will appear on EA Access, although it's not confirmed how far ahead of launch it will happen. If previous releases are anything to go by, then it should be five days before launch, so November 13 2015 seems like a good guess. Here's the strange live-action trailer starring Anna Kendrick. One of the main draws for Star Wars fans will be the chance to play as iconic Star Wars characters. So far, Luke Skywalker, Darth Vader and Boba Fett have been announced, but EA Community Manager Matthew Everett recently teased that more hero characters are coming. These Hero characters won't be rewarded based on skill like killstreak rewards are in Call of Duty, but instead dropped randomly into the battlefield as tokens. Until now, we could only guess what it'd be like to play as the emperor, but thanks to the new Star Wars Battlefront launch trailer that EA put up on YouTube we can say with absolute certainty it's going to be awesome. Normally, pre-order bonuses offer little incentive for you to actually risk your money before the reviews come out - all too often they're just character skins or gold weapons for multiplayer. However, Battlefront's pre-order bonus is genuinely enticing. If you've seen the recent Star Wars: The Force Awakens trailer (and who hasn't), then you'll have seen that downed Star Destroyer in the desert. In Star Wars Battlefront, you get to take part in the battle that results in that destroyed ship. It'll arrive in the form of the Battle for Jakku downloadable content, which will be made available to those who pre-order first on December 1st 2015. It will then be opened to everyone for free a week later, on December 8th 2015.